The concept of ‘crimes against humanity’, which now lies at the core of international criminal law, was first codified in the London Charter in 1945, which was the legal basis of the Nuremberg trial. It had been used in a diplomatic context 30 years earlier, when Britain, France and Russia, referring to what is now called the Armenian genocide, sent a message to the Ottoman rulers protesting ‘these new crimes of Turkey against humanity and civilization’. The term seems to have been used in a more colloquial sense prior to 1915. In my book Genocide in International Law (2nd ed., Cambridge: Cambridge University Press, 2009, p. 20, note 15), I referred to the two examples that I knew of: in 1890, an African-American journalist, George Washington Williams, wrote to the United States Secretary of State that King Leopold’s regime in Congo was responsible for ‘crimes against humanity’ (see Adam Hochschild, King Leopold’s Ghost, Boston and New York: Houghton Mifflin, 1998, p. 112); in 1906, US diplomat Robert Lansing described the slave trade as a crime against humanity (Robert Lansing, ‘Notes on World Sovereignty’, (1921) 15 American Journal of International Law, p. 13 at p. 25). 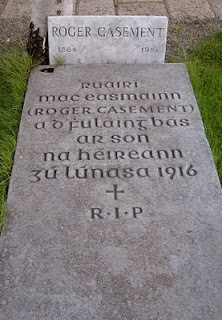 Now we have a third example, from Irish humanitarian and patriot Roger Casement. I have to thank one of our doctoral students, Michelle Farrell, for this. Michelle stopped by the Strand bookstore in New York last week on her way back from presenting a paper at the International Studies Conference in New Orleans. She picked up a volume on Casement that referred to crimes against humanity, and that put her on the track for the actual references. They appear in Casement’s Putamayo Journal (available on Google book in The Amazon Journal of Roger Casement, edited by Angus Mitchell), the diary he kept while conducting his humanitarian investigation into atrocities committed against the Putamayo Indians. Casement was posted as a UK diplomat to Brazil at the time, and was consular representative to the commission investigating rubber slavery in the Amazon region. Casement’s diaries have themselves been shrouded in controversy. Parts of them recorded his homosexual activities with adolescents. When Casement faced the gallows in 1916 for his support of Irish independence, the references in the diaries were shown by the British to his supporters in order to weaken the campaign against his execution. It has long been argued that the so-called ‘black diaries’ were forged by British intelligence, but there now seems to be fairly general recognition that they are genuine. Casement was hanged in Pentonville Prison, in London. The body was repatriated in 1965. He was given a State funeral and is buried in Glasnevin Cemetery in Dublin. Thanks, again, to Michelle Farrell. Professor Alain Pellet, of the University of Paris-Nanterre, and former president of the International Law Commission, has prepared a legal opinion supporting the view that Palestine is a ‘state’ for the purposes of article 12(3) of the Rome Statute. As a result, he concludes, Palestine’s declaration last January (see this blog) validly gives jurisdiction to the International Criminal Court, and enables the Prosecutor to launch prosecutions relating to war crimes committed in Gaza, in accordance with article 15 of the Statute. Article 12(3) of the Statute allows a State that is not a State party to the Statute (i.e., a member of the Court) to nevertheless give jurisdiction to the Court. It raises the question of Palestine's status as a 'State' under international law. Professor Pellet argues that rather than consider this question in an abstract and general sense, it should be narrowed. This issue is whether or not Palestine is a State for the purposes of article 12(3), that is, for the simple purpose of giving the Court jurisdiction over international crimes, rather than for all purposes. Professor Pellet invites people to add their names to his opinion, by communicating with William Bourdon (w.bourdon@bvb-avocats.com). He asks that he be copied on any correspondence (courriel@AlainPellet.fr). If readers prefer to make comments or suggestions, they may also submit them to this blog. See this very interesting research project on violations of the laws of armed conflict in video war games. Methods of Human Rights Research is a new publication from Intersentia, edited by Fons Coomans, Fred Grünfeld and Menno Kamminga. It is described as 'essential reading for any PhD candidate embarking on a dissertation in the field of human rights and any human rights scholar wishing to critically reflect on the quality of her/his own methods of work'. Intersentia has also issued a Research Guide to Instruments of European Regional Organization. Graduates of the National University of Ireland are eligible for a number of interesting fellowships, most of them at the post-doctoral level. Several of them would appeal to students who have completed a doctorate in human rights or who are in the course of completing one, including the Phelan fellowship in international law and the travelling fellowships. Professor Elies van Sliedregt, of the Free University in Amsterdam, is looking for 2 PhD students for a research project on harmonization in (substantive) international criminal law. For more information. The Geneva Academy of International Humanitarian Law and Human Rights will hold its third annual training course on Monitoring Economic, Social and Cultural rights. The course will provide participants with the know-how to get started in monitoring economic, social and cultural rights. It will take place in parallel with the May session of the Committee on Economic, Social, and Cultural Rights in order to allow course participants to observe the Committee in session. BEIJING, Feb. 10 (Xinhua) - A Chinese court official said the country's new guidelines to limit use of the death penalty will not undermine public safety, reassuring citizens concerned about public safety and social stability. "The limited use of the death penalty won't result in a less vigorous crackdowns on crimes or negatively affect social stability. It's reasonable to administer justice tempered with mercy when it comes to the death penalty," Gao Guijun, a judge with the Supreme People's Court (SPC), told Xinhua Wednesday. Parts of the new guidelines raised public concern, especially the article that recognizes financial compensation as a factor possibly reducing sentences. Some citizens interpreted the article as meaning "money can buy a life." those who sever! ely harm national security or social order, or those who violate people indiscriminately with serious malicious intent, compensation won't bring any mercy," Gao said. China's Supreme People's Court announced Tuesday guidelines for courts handling criminal cases. The guidelines require the courts to apply the policy of "justice tempered with mercy," which stresses that death penalty use should be limited. "Reprieves and commutation were widely used in the past sentencing of ex-officials who took advantage of their public position. This should be changed," said Qu Xinjiu, head of the law school at Beijing-based China University of Political Science and Law. According to the guidelines, commutation and paroles for such officials, especially those at county-level or above, are required to be heard at court. Sun Jungong, spokesman with the SPC, said the guidelines emphasized the relationship between law enforcement and the policy of "justice tempered with mercy." The guidelines are an interpretation of the "justice tempered with mercy" policy and details on the judicial principles to be used when handling criminal cases, Sun said. The policy required courts to issue both severe and lenient sentences, depending on the seriousness of each crime. 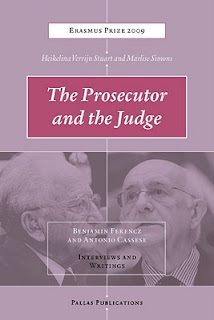 Interviews with Ben Ferencz, former Nuremberg prosecutor, and Antonio Cassese, the first president of the International Criminal Tribunal for the former Yugoslavia and now the president of the Special Tribunal for Lebanon, make up a new book, The Prosecutor and the Judge, published by Amsterdam University Press. I’m told that the Press will post the pdf of the entire book, but at present it seems that only a preview is available. The interviews, conducted by Heikelina Verrijn Stuart and Marlise Simons, are fascinating. Yesterday, a Pre-Trial Chamber of the International Criminal Court refused to confirm the charges against Sudanese rebel leader Idriss Abu Garda, who was charged with respect to attacks on peacekeepers in 2007. There was no doubt the crime took place, but there simply wasn't enough evidence to make out a case that Abu Garda had been responsible for ordering or directing it, said the Chamber. Under article 61, the Pre-Trial Chamber can confirm charges only where there is 'sufficient evidence'. It is the first time a Chamber has declined to issue any charges. In other rulings, Chambers have issued some but not other charges, and in one case a Chamber actually added charges. Two other applications for arrest warrants concerning the same events have been pending before the Pre-Trial Chamber for well more than a year. But he hasn't been 'acquitted'. It's just that the Prosecutor charged him and produced evidence at a hearing and there wasn't enough of it and the Pre-Trial Chmaber said so. I am very sorry to report the death in England last Friday of Peter J.A. Calvocoressi, age 97. He was, to my knowledge, the last surviving British attorney and senior officer to have participated in the work of Nuremberg. During World War II, Peter Calvocoressi, a barrister, became a Royal Air Force Wing Commander. He served at Bletchley Park as part of the team in “Hut 3” that interpreted decrypted German army and air Enigma messages, selecting the information that was sent to Allied military commanders in the field. This intelligence work, which Calvocoressi later wrote about in Total War: The Causes and Courses of the Second World War (1972) and in Top Secret Ultra (1980), was vital to the Allied victory. In summer 1945, Calvocoressi, still a RAF officer affiliated with British intelligence, became de facto a member of Justice Robert H. Jackson’s London staff that was preparing to prosecute Nazi war criminals. (a YouTube film clip includes Calvocoressi speaking in later years about the Allied decision to prosecute captured Nazi leaders) Calvocoressi’s Bletchley Park colleague and friend Colonel Telford Taylor, a senior member of Jackson’s team, told Jackson of “Calvo” and arranged for his recruitment. Calvocoressi provided expertise on German military and Nazi Party organizations, assembled and analyzed evidence for trial, handled liaison work with leaders of U.S. intelligence agencies, and participated in drafting what became the Nuremberg indictment. Beginning later that fall, Calvocoressi was a member of the British prosecution staff at Nuremberg. He worked closely with Jackson, Taylor and others on the U.S. staff, and with each chief prosecutor and his national team. As the international trial neared its conclusion in spring 1946, Jackson was so grateful that he proposed that the United States award a military decoration to Calvocoressi (“although he is not of our own staff”). During the subsequent Nuremberg trials that the U.S. conducted during 1946-49, Calvocoressi continued to assist then-chief of counsel Taylor (and later described himself as, in this work, “an honorary American”). There is an obituary in Daily Telegraph. Previous posts on this blog have discussed the attempts by the Stephen Harper government in Canada to undermine the independence - and destroy the reputation - of Rights and Democracy. For a fine comment on the situation, see editorialist Haroon Siddiqui in today's Toronto Star. The last issue of the New Yorker has a very fine and thoughtful article by George Packer about the city of Dresden, the bombing, commemoration, etc. Readers of the blog will know of my interest in issues of moral equivalency. Packer notes that neo-nazis carry signs at rallies stating: 'Auschwitz + Dresden = 0'. This recalls the debates about the supposed need to prosecute both sides in a conflict, in order to facilitate proper justice and, eventually, reconciliation. I'm a sceptical. Packer gets it right, I think, striking a balance between the need to acknowledge the horror (and the illegality) of the bombing of Dresden, but without distorting the historical record by suggesting that 'atrocities were committed on all sides'. I wish I could refer you to the entire article, but the website will only provide the abstract. http://www.newyorker.com/reporting/2010/02/01/100201fa_fact_packer. Today, the Appeals Chamber of the International Criminal Court released its long-awaited decision on the arrest warrant application in the case of President Al-Bashir of Sudan. Last March, a Pre-Trial Chamber issued an arrest warrant, for crimes against humanity and war crimes, but denied the charge of genocide. On the appeal of the Prosecutor, it was held that the Pre-Trial Chamber imposed too rigorous a standard and the case has been returned for it to rule again. This is all much ado about nothing. Given the close overlap between genocide and crimes against humanity, even with the existing arrest warrant the Prosecutor would be unconstrained in producing relevant evidence that might lead to a conclusion that genocide was taking place. The judges would be relatively free to add a conviction for genocide, if they thought it appropriate. What the Pre-Trial Chamber was doing, however, was giving the Prosecutor some helpful guidance: don’t be obsessed about trying to establish genocide, because the case looks frail. Such interlocutory decisions of the International Criminal Court require leave to appeal. In the Bashir arrest warrant case, this was granted by the Pre-Trial Chamber on 24 June 2009. It has taken the Appeals Chamber more than seven months to rule on this rather simple issue. It cannot, in fact, have been very complicated, because today’s judgment is only 18 pages long, most of which consists of a recital of the procedural history and the positions taken by the parties. There are really only 5 pages of substance in the ruling. And the original justification for the interlocutory appeal is to obtain an ‘immediate resolution’ of the issue (see article 82). To this should be added two individual or dissenting opinions, both of them penned by Judge Song, totalling less than ten pages. When I say ‘of substance’, this is because most of the decisions consist of a review of the proceedings and the positions of the parties, something that a second-year law student or a good intern could prepare. So, that means that the total output of the five judge of the Appeals Chamber, with their legal assistants, for a twelve-month period, is 213 pages of decisions, of which 79 pages are of real substance. Each one of our LLM students in the programme at the Irish Centre for Human Rights has to produce more in order to get their degree! One might also look at the transcripts of proceedings before the Appeals Chamber. Based on the Court’s website, it would seem that the Appeals Chamber held five days of hearings over the past twelve months. Four of the ten significant Appeals Chamber decisions of the past twelve months involve accused persons who have not been apprehended and are not in custody! Let me be clear that I am not blaming the judges of the Appeals Chamber for this state of affairs. They are doing their jobs. They can only hear the appeals that come to them from the Trial and Pre-Trial Chambers, with the exception of the cases they must hear as of right (over the past year, there were two such appeals, one of them involving defendants not in custody). In the more than six years since the Appeals Chamber began functioning full time there have been, of course, no appeals on the merits, because no trial has been completed. It seems likely that over the next four to five years there will probably be no more than four appeals on the merits. International human rights law only requires an appeal from a guilty verdict. It is hard to justify a full-time Appeals Chamber, as this record indicates. Would it not make more sense to have a stand-by Appeals Chamber, whose judges might tear themselves away from other pursuits to manage the five days of hearings a year and to review the 70 pages of substantive judgments? We could also consider limiting further or even eliminating entirely the practice of interlocutory appeals. Are they really necessary? Perhaps the paucity of output from the Appeals Chamber is simply an indication of how unimportant such interlocutory appeals really are. If they were really so necessary, we would expect the case law of the Appeals Chamber to be more substantial and more significant. Most national criminal justice systems rarely if ever see an interlocutory appeal in criminal trials. They delay the proceedings, and they may prove to be of no relevance if the accused is ultimately acquitted. Why not wait for the verdict? Take the Bashir arrest warrant as an example. To my knowledge, even the ad hoc tribunals have never had appeals from the issuance of an arrest warrant or indictment. There, the judge rules on the matter and if the Prosecutor is unhappy, too bad. We move on. At the International Criminal Court, on the other hand, seven months are consumed deliberating on the matter and then drafting a rather laconic opinion. As the Gershwin tune goes, ‘nice work if you can get it’!